Manuel visits the Brooklyn studio of street artist (also w/ intense oil painting skills) Dan Witz whose show, WTF, just opened on Saturday @White Walls here in SF. ~CHECK IT. Street artist and Brooklyn based Dan Witz opens his show What The %$#@? Saturday at White Walls. Be on the look out around San Francisco as Dan's been going to town leaving his work round the streets of our grand city --> PHOTOS. White Walls is pleased to present What The %$#@? (WTF), an exhibition by prolific Brooklyn-based artist, Dan Witz. The WTF exhibition will be showcasing the artist’s Dark Doings series, both inside the gallery as well as on the streets of San Francisco. Witz is known for using his mastery of the visual deception of trompe-l'oeil and photorealistic painting techniques to create conceptual visual pranks, producing a definitive and unparalleled street art practice. The artist’s debut San Francisco solo show will be comprised of approximately 30 mixed and digital media works in custom framing hand-created by the artist. 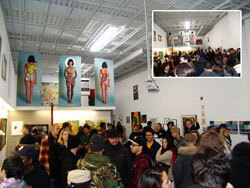 The opening reception for What The %$#@? (WTF) will be held at White Walls on January 08, 2010 from 7-11 PM. The exhibit will be on display through February 05, 2011 and is free and open to the public. Some recent San Francisco activity. Click the image or here to view more.